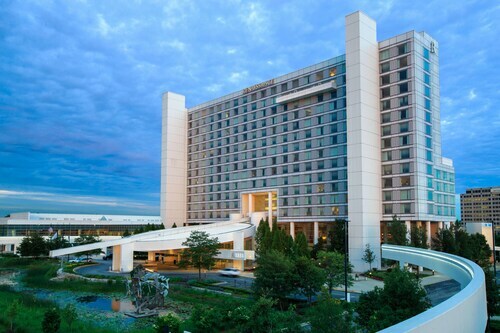 Hyatt Regency Schaumburg Chicago is a 3-minute shuttle ride from Woodfield Mall. It's a 5-minute drive to Schaumburg Convention Center, and 30 minutes to the airport. Guests can walk 10 minutes to Busse Forest Nature Preserve, and 5 minutes more to The Streets of Woodfield shopping center. 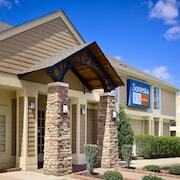 Hyatt Place Chicago/Schaumburg is a 5-minute walk from Woodfield Mall, home to over 300 stores and eateries. It’s a 20-minute drive to Chicago O'Hare International Airport, and 40 minutes to downtown Chicago and Lake Michigan. Busse Forest Nature Preserve is 10 minutes by car from the hotel. Situated in the suburbs, this hotel is within 2 mi (3 km) of Woodfield Mall, Legoland Discovery Center, and Schaumburg Convention Center. Schaumburg Medieval Times is 2.6 mi (4.2 km) away. Situated in the suburbs, this hotel is within a 10-minute walk of Ned Brown Forest Preserve and Legoland Discovery Center. Woodfield Mall and Schaumburg Convention Center are also within 3 mi (5 km). Situated in Schaumburg, this hotel is within 3 mi (5 km) of Schaumburg Medieval Times, Woodfield Mall, and Schaumburg Convention Center. Harper College is 1.9 mi (3.1 km) away. AmericInn by Wyndham Schaumburg offers a free shuttle service to local corporate accounts Monday through Friday by reservation only. It’s less than an hour’s drive to the Magnificent Mile and the Navy Pier in Chicago. Chicago’s O’Hare International Airport is 15 miles (24 kilometers) away. 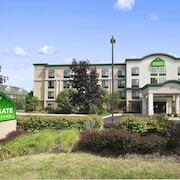 Located in the heart of Schaumburg, this hotel is within 1 mi (2 km) of Harper College and Schaumburg Medieval Times. Woodfield Mall and Schaumburg Convention Center are also within 3 mi (5 km). The Renaissance Schaumburg Convention Center Hotel in suburban Chicago is 1 mile from Woodfield Mall. Downtown Chicago is 32 miles away and Six Flags Great America is 33 miles away. Across from the Copley Center office park, this Chicago hotel is also within 2 miles of the Schaumburg Convention Center and Woodfield Mall. How Much is a Hotel Room in Schaumburg? Hotels in Schaumburg start at $49 per night. Prices and availability subject to change. Additional terms may apply. 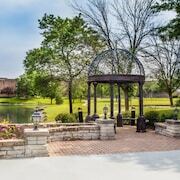 If you are looking for the best places to stay in Schaumburg, you'll have no shortage of options. Travelocity is where you can find 59 establishments within 6 miles (10 kilometers) of Schaumburg's downtown precinct. Travelocity users wanting to base themselves in the center of Schaumburg, can come across the Sonesta ES Suites Schaumburg Chicago and Homewood Suites by Hilton Chicago - Schaumburg. If you are coming to Schaumburg, but are on a budget and are after slightly lower priced hotels or apartments, we also have plenty of economy hotels on offer in the vicinity. 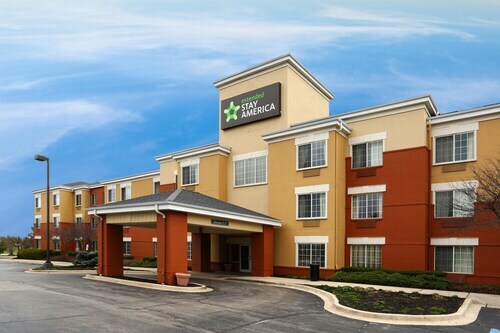 The Extended Stay America Chicago- Woodfield Mall-Convention Ctr is 0.7 miles (1.2 kilometers) from the center of Schaumburg, while the Wingate by Wyndham Schaumburg / Convention Center is 1 mile (2 kilometers) away. The Wyndham Garden Schaumburg Chicago Northwest and the AmericInn Hotel & Suites Schaumburg are alternative lower-cost hotels that you could consider. The The Hyatt Lodge at McDonald's Campus is situated 15 miles (25 kilometers) from the central part of Schaumburg. If you would prefer another option, the Hilton Chicago O'Hare Airport is situated 9 miles (15 kilometers) away. The The Westin Lombard Yorktown Center and the Carleton of Oak Park are some other Travelocity-listed places to base yourself around Schaumburg. Gurnee is 25 miles (38 kilometers) north of Schaumburg and is home to Six Flags Great America and Gurnee Mills. 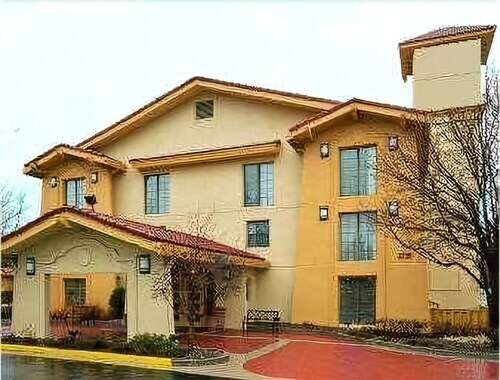 A few Gurnee hotel establishments include the KeyLime Cove Indoor Waterpark Resort and SpringHill Suites by Marriott Chicago Waukegan/Gurnee. 15 miles (24 kilometers) northwest of Schaumburg, you will reach Algonquin, which features the Holiday Inn Express Hotel & Suites Chicago-Algonquin and Victorian Rose Garden. If you're staying in Algonquin, a couple of sights worth adding to your itinerary are the Terrace Hill Golf Course and Raging Buffalo Snowboard Ski Park. Prior to departing Chicago, you should certainly ensure you join the locals watching an exciting game of sport. Make your way to Wrigley Field, which you can find to the east of Schaumburg. Wise visitors that hope to book Travelocity-listed hotels close to the action can compare the Roscoe Village Guesthouse or the Best Western Plus Hawthorne Terrace Hotel. O'Hare International Airport is a convenient gateway for air travel, and is located 9 miles (15 kilometers) from Schaumburg's central precinct. Nearby accommodation options are Loews Chicago O'Hare Hotel and The Westin O'Hare.